Michael Aram necklace from the Enchanted Forest Collection. Polished 18-karat yellow gold hardware and chains. Diamond pavé twig wrapped drop cap. 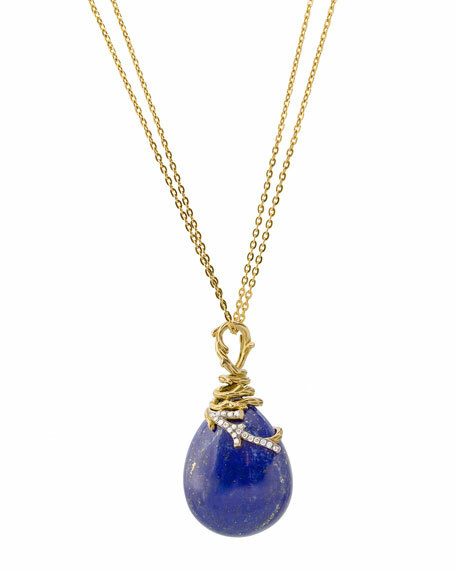 28mm x 21mm lapis pear pendant. The Michael Aram Enchanted Forest Jewelry Collection is inspired by the natural world, which is endlessly evolving. The designs capture the ephemeral spirit of the forest and the organic textures found there. The colorful jewels evoke a dreamlike vision of nature.